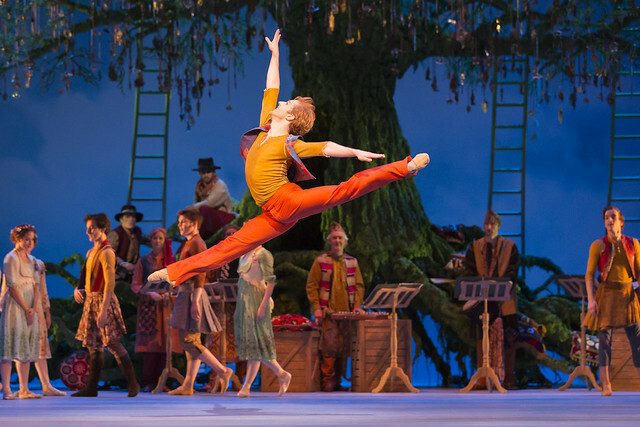 Christopher Wheeldon's new Royal Ballet production The Winter's Tale was screened live across the world on 28 April as part of the ROH Live Cinema Season 2013/14. The ballet reunites the creative team behind Alice’s Adventures in Wonderland. ‘We spent an amazing three days forensically taking it apart, ending up with a synopsis that was incredibly detailed, right down to the timings,’ says composer Joby Talbot. A key element of The Winter’s Tale is the contrast between the two worlds explored in the ballet and composer Joby Talbot has created a score that depicts these drastically different moods, ranging from the troubled tension of Act One, to the joyful setting of Bohemia (which includes an on-stage folk band) to the emotional conclusion in Act Three. Read audience reactions to the cinema screening and add your own review. The Winter’s Tale runs 12 April –10 June 2016. Tickets are available on 19 January 2016.
saw the transmission last evening and have been going over it in my mind all day, it was just brilliant in every possible way, the simple set for Act 11 with the fabulous tree dominating the scene was a real gem. A stunning ballet, score, set, costumes, dancers, musicians, stage crew, House Staff too, (hope I have not missed any group out)many, many, many congratulations to absolutely everyone involved. Fantastic choreography music and sets - WELL DONE !!!!!! This was a complete revelation. This was a 50th birthday present and was unforgettable. I have been watching ballet since I was a little boy as my mother used to teach ballet and very rarely have I come across a collaboration in the theater that works on so many levels. It has inspired me to find something of that kind of original creativity in my own work. What a gift. Many thanks. Will the music of this ballet come out one day ? Or any dvd ? I really enjoyed at the cinema, it was one of my greatest experience of recorded live ballet. No DVD/CD release has been confirmed yet, but do keep an eye out on these pages for future details.